Saxon Class II K Steam Locomotive (new). The performance of the class I K units was soon insufficient due to greatly increasing traffic. Despite this, four units were rebuilt into double locomotives as a test in order to continue to make use of the roster of class I K locomotives. The model of the locomotive is new tooling and has traction tires, a DCC interface connector, built-in lighting for the engineer's cab, and a smoke generator. The headlights change over with the direction of travel. Two powerful motors drive all of the axles. Length over the buffers approximately 56 cm / 22-1/16"
The Saxon Class II K (new) Increasing levels of traffic on Saxony's narrow gauge lines soon revealed the performance limits of the small class I K. In 1913, the Saxon State Railroad therefore attempted an experiment by coupling two class I K to double the tractive effort by retaining the wheel set running mass. 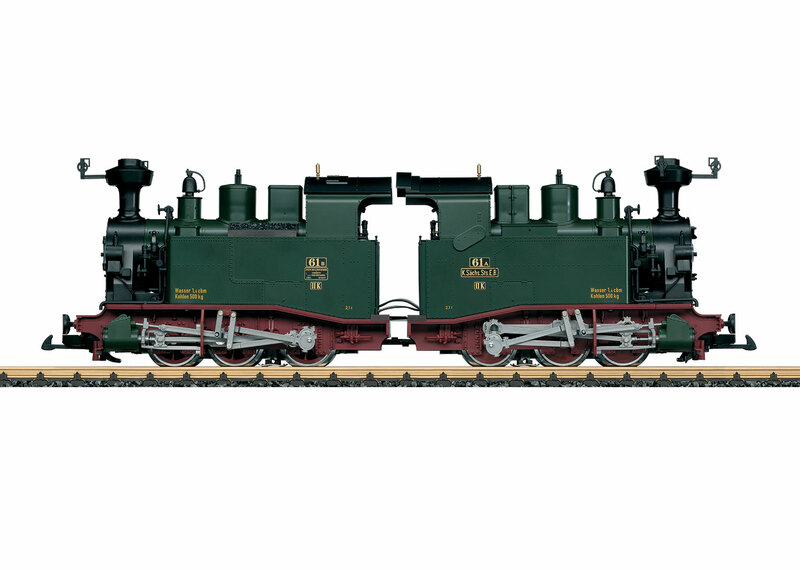 Two double locomotives were made from the units with road numbers 1 and 4 as well as road numbers 2 and 3. All four were built in 1881/82 by Hartmann in Chemnitz. On these units the back walls of the engineer's cab were removed and in each case two locomotives were coupled together with the engineer's cabs. These double units were given the new road numbers 61 A/B (former 1 and 4) and 62 A/B (former 2 and 3) were now designated as the class "II K neu". Each pair of locomotives had a common throttle, but the valve gear remained separate. The operation of these locomotives was in all likelihood not much simpler than previously. The two boilers, each with 0.66 square meters / 7.1 square feet of grate and 29.72 square meters / 319.9 square feet of heating surface, generated enough steam to allow the 21.6 metric ton heavy class II K (new) to develop 2.66 metric tons of tractive effort anyway. The indexed performance increased to 140 kilowatts / 190 horsepower, but the maximum speed remained at 30 km/h / 19 mph. Although the conversion of other locomotives had been planned, there were various problems in the way of these plans. Chiefly the unpopularity among crews and the shortcomings during operation quickly banished these plans to the backburner. As early as 1916 the "marriage" of the 62 A/B was annulled and the two individual units operated again under their old road numbers. Road number 61 A/B on the other hand remained preserved as a double locomotive until it was retired in 1923. The planned new classification by the DRG as road number 99 7551 therefore never took place.